At the start of the 1840s there was no church or school in Cookham Dean but the Vicar of Cookham, the Rev J Grantham, and the Vicar of Bisham the Rev F Vansittart Thornton determined to remedy this situation where “ignorance and immorality had prevailed for some time past”. In July a committee was formed and a Subscription List opened, headed by a £20 donation from HM the Queen Dowager, Adelaide. In September the Bishop of Oxford licensed a small cottage for worship. 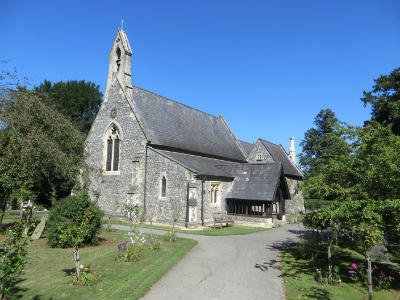 Mr Hodson, the first vicar of Cookham Dean, moved in and his ministry began on 5th November 1843. (In fact there was seating for 303 including 96 children. The backs of the pews were 31 inches [79 cms] upright and adults were allocated 20 x 34 inches [51 x 86 cms] and children 15 x 24 inches [38 x 61 cms]. Later capacity was reduced but comfort improved when the width of seating was increased). The consecration of the church by Richard Bagot, Lord Bishop of Oxford, took place on 15 May 1845.